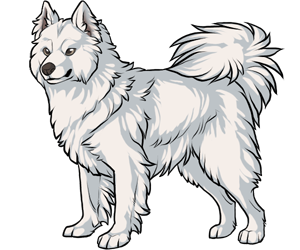 The Samoyed is an ancient Working dog breed. Samoyeds originated in Siberia where they lived alongside a tribe of hunters and fishermen called the "Samoyeds". The breed was used by the tribe as sled dogs, reindeer herders, and guard dogs. Surprisingly, there is no wolf or fox mixed into the breed; the gene pool is closely tied to the primitive dog. Explorer Robert Scott brough the dogs into England in 1889, where the dogs were then spread throughout the world. The AKC recognized the Samoyed in 1906. The Samoyed was named after the tribe of Siberians, The Samoyeds, who created the breed. Samoyeds are nicknamed the "Smiling Sammy", because of their mouth having a smiling position.